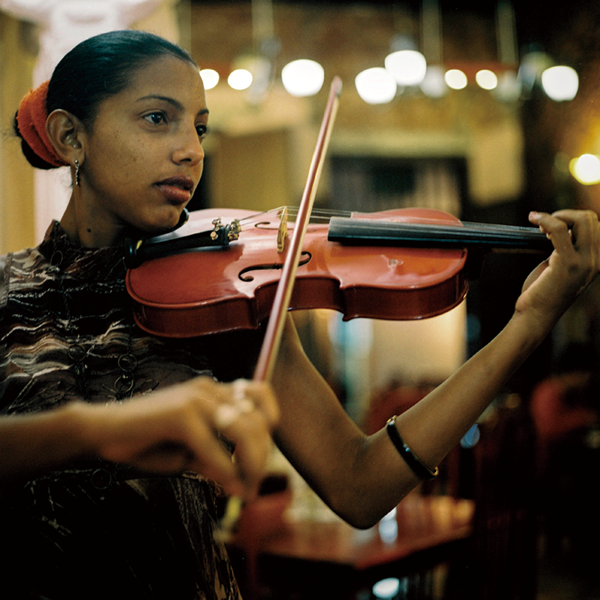 Cuban salsa band “Grupo Novo Alte” is a new band started by singer violinist Irina and guitarist Pavel. The two of them work as music teachers during the day at a school and perform at restaurants and bars all over Cuba during the night. “At school I teach various instruments, singing, and dance. I come home at 6, shower, and start work again,” they say with a laugh. Impressive. Isn’t that exhausting? I visited these two musicians to see where they get their energy. “We eventually want to perform in a big band. We have to experience a lot and improve our skills to make that happen.” Their music was incredible. I bought their hand-made CD with a color-copy label as a cover. Their dream is to one day become professional musicians and tour Italy and Spain. They left me with a hopeful smile and jumped back on stage.